On February 1 (February 14 in old style), Bulgarians celebrate Trifon Zarezan - one of the oldest customs in the Bulgarian folk calendar. This is a labor custom associated with the first year of the vines processing - the spring incision. The feast also dates back to Zarezinovden, Triphun Chipia, Triphun Zareozj, Trifun drunken. On this day, Trifon, Trifonka, Lozan, Lozanka, Grozdan, Grozdanka, Radko, Radka, Racho, celebrate. On this day, winegrowers, gardeners and pubs are celebrating. Holy Martyr Triphon was born in Kamsada, Phrygia (Asia Minor) in 227 AD. These lands are considered as one of the forests of the vine and wine. He learned about his healing abilities and healed the daughter of Emperor Gordian. He is murdered when he is 21 years old, by the irreconcilable enemy of Christians - the Roman imperial suitor, Deci Trajan, for not giving up his faith. In the older icons, the saint is depicted with a coder (sickle-tree) and perhaps because of this, the belief in the Bulgarian beliefs is that he was a vine-grower and a keeper. The Order of St. Triphon stands directly connected to the pruning of the vines. The studies of a number of Bulgarian scientists link the image of St. Trifon with a transformation of the old gods Sabazius, Dionysius, Bromy, Bacchus, Lycurg. St. Trifon's wine festival continues an old agricultural tradition in a new form, with the Christianization of Eastern European territories. It is no accident that the beginning of February is the calendar period at the boundary between winter and spring, in which the transient carnival games related to the awakening of the vegetation and the dying and again rising nature gods are concentrated. Orphan calendar Saint Triphon is celebrated on February 1. The holiday is included in a cycle of 3 consecutive days called Triphunts - 1, 2, 3 February. They are celebrated as follows: on 1 February - Trifonovden; on February 2 - Holy Priest, on February 3 - St. Simeon. The ritual food for the vineyard is prepared by the women - a breadcrumb decorated with dough pieces in the form of a vine leaf or grapes, boiled, filled with rice, hen, cheese, lard; pickle, lobanka, bean (stuffed stomach with meat) and more. In addition, a flask of red wine or brandy, decorated with chipsir, geranium, ivy, tied with red thread, is prepared. The scraper to be discharged is pre-cleaned and sharpened well. The custom is to mix bread - fresh or quaint, to bake a hen, which is traditionally filled with rice or bulgur. When the chicken is cooked, it is baked on a sage. In a new woolen bag is put the cake, the hen and the wine bottle. With such bags on their shoulders men go to the vineyard. In traditional culture, the cutting of vines is a very male activity, women are not allowed. This explains the taboos for women this day, not to go over the vineyard "because it is not a woman's job and to give birth to the vineyard." This day is forbidden to women and cut, because "St. Trifon on this day cut your nose. " Ritual practices show considerable unity. Each man drops in their vineyard 1-2-3-4-5 ("gigi", "huben") and from each kutuk or all sticks or 2-3-5 pieces. He baptized himself, watered wine around the pot, drank with the coder and watered again by blessing. In some places, they shave with holy water from the trifenden water. After every farmer has abandoned his vineyard, they all gather at a common table. On the ground on long towels are the cakes, the hens and the other brought food, as well as the flasks of wine. A large bunch of basil, in which three vine sticks are placed, is placed in the middle. The oldest and most respected vineyard picks up the wrist and says, "Whoever is happy, let him take his wrist and become a king!" Everyone has the right to take the wrist, but usually the young ones retreat to an adult and experienced vineyard and especially to the one who is already " reigned ", and during his" reign "there was no hail or drought, but fertility. As soon as he takes his wrist, the rest of him are happy with the "kingdom," and the feast begins. "The King" is decorated with a wreath of grape rods that he wears on his head, and with another crown that he puts over his shoulders. He sits on a wheelchair, picks him up in a car, or the viticultors carry his hands and, under the sounds of bagpipes, gadulki and drum, head to the village or town. They stop there in front of each house. The housewife puts wine in a white boiler, gives the king the first drink, then draws the people of his congregation. 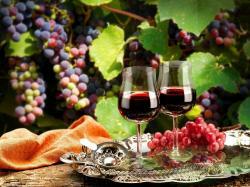 The remaining wine in the boiler splashes over the king and the blessing is said: "Come on, let's get it! To flow through the thresholds! ". The king responds to the blessing of the Amen. As soon as he arrives at his home, the king dresses up with new clothes and, sitting with the crowns of his head and shoulders, he sits on a long table to welcome guests and people from the whole village (urban neighborhood). That is why, as a king of this feast, a wealthy man is chosen. The tour of the village from the vineyards ends in the king's house, where there is again a feast and a great “horo” (bulgarian folk dance). Women also take part in the rural celebration. Horo (bulgarian folk dance) has a key character at the holiday. Horo is played by the men on the vineyard with grape harvested in the belt or crowned with wreaths. Horo is played on the common table of the vineyards, people and rachenitsa are played on the road from the vineyards to the village. Finally, in the middle of the village, on the square, there is the so-called "Zarezansko" or Trifonsko horo. It should be prepared with the necessary attention of the hostess. Already at dawn, she was getting ready to make fresh cakes. For this purpose only 1 kg of flour and 1 teaspoon of salt are needed. Flour is sifted to keep only the purest of it. Then it should be evenly advised to mix the dough by adding 2 teaspoons of lukewarm water. The dough mixes as it begins to form a bullet. Then the cake is baked in a well preheated oven. Once the cake is ready, cover it with a cotton towel so that its bark does not dry. As a main dish in old Bulgarian custom is recommended stuffed hen with rice or bulgur.